This is plated with an anti-corrosive finish, Commercial Grade and Quality. The BNC connector is used for RF signal connections, for analog and Serial Digital Interface video signals, amateur radio antenna connections, aviation electronics (avionics) and many other types of electronic test equipment. 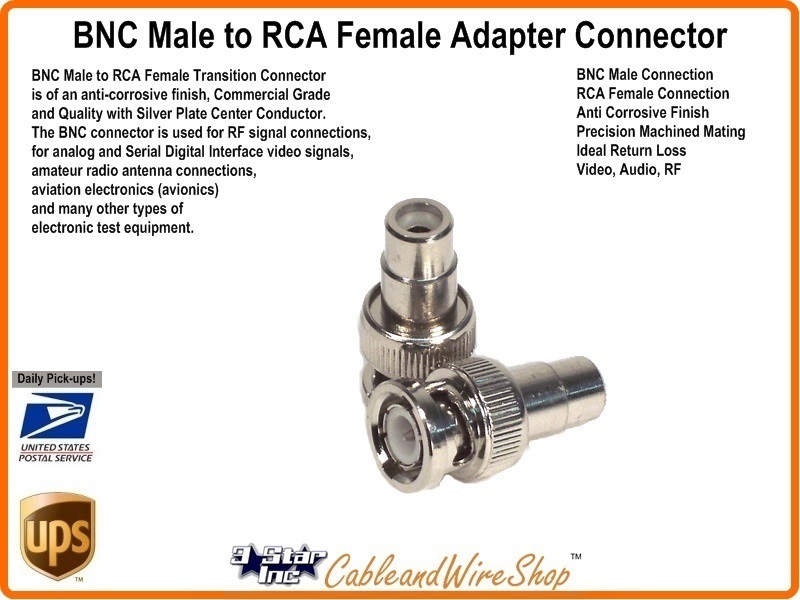 It is an alternative to the RCA connector when used for composite video on commercial video devices, although many consumer electronics devices with RCA jacks can be used with BNC-only commercial video equipment via a simple adapter. An RCA jack, also referred to as a phono connector or CINCH/AV connector, is a type of electrical connector that is commonly used in the audio/video market. Note: Technicians will use this connector to transition from pre-made Video and Audio Feeds to Test Equipment Leads.